How Much Would You Pay for a Holy Grail Google Stadia Subscription? Filed to: How much will it cost?Filed to: How much will it cost? 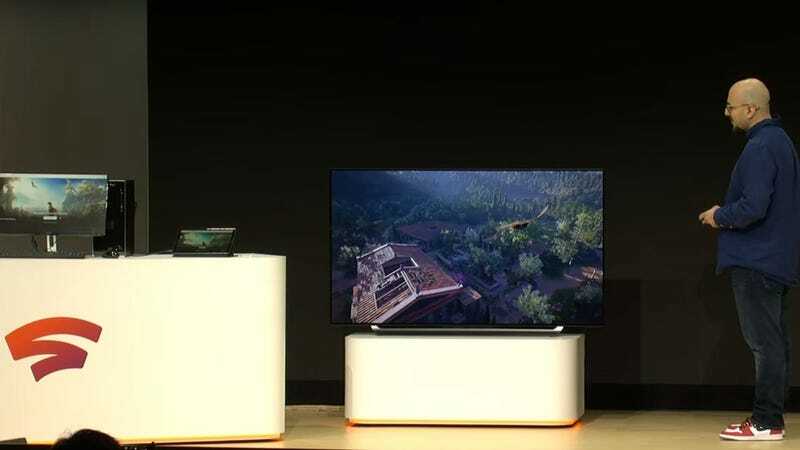 Today was the big coming out party for Stadia, Google’s upcoming game streaming platform that promises to let you play games over the internet on practically any device, and hopefully lag-free. However, despite shedding light on how it works and what kind of server infrastructure Google is using, there were a couple of key details about Stadia Google didn’t reveal including its price structure and when it will be officially available. All we know for the latter is that Stadia will go live sometime this year, but the more important question is the one about price. So I ask, how much do you think Stadia will cost, or more specifically, how much would you pay for Google’s game streaming platform? Now a lot of this will come down to how well Stadia actually functions, especially for people with less reliable internet connections. But for the sake of our hypothetical question, let’s assume Stadia works as advertised. Now that we have the ground rules set, there are essentially two ways Google can go with Stadia’s pricing. One would be to position Stadia as a sort of Netflix for games, where a monthly subscription would give you access to a roster of games that you could play on your tablet, laptop, etc. Users wouldn’t be responsible for buying actual games, and instead, it would fall upon Google to license new titles and add them to Stadia’s roster. Sony’s PlayStation Now, costs $20 a month and lets you stream over 750 PS2, PS3, and PS4 games to your PS4 or PC. Meanwhile, Nvidia’s GeForce Now service lets you stream games to a Windows or Mac PC, or one of Nvidia’s Shield devices. However, because GeForce Now is still in beta, Nvidia isn’t charging anything for it yet. Then there are smaller game streaming services like Jump, which normally costs $10 a month, but at the time of writing, has been discounted to just $5. Alternatively, with a monthly price of $30, Shadow’s streaming service is on the higher side of things, though it combats that price by offering high-res gameplay at 1080p at 144Hz, or 4K at 60Hz. And while Microsoft’s Xbox Game Pass isn’t technically a game streaming service, it’s yet another service Google Stadia will have to compete with, which makes it $10 a month pricing relevant. If Google does opt for a subscription model (which I think is the most likely outcome), Stadia will probably end up costing between $15 and $20 a month, which is slightly more than a Netflix sub, but still low enough that even after a year, you will have saved money compared to buying a traditional console and a game or two. The other option would be for Google to make Stadia free, or available for some very low nominal price, and instead ask users to buy games digitally on a Steam-like Stadia store, which people could then use to stream games to their devices. From Google’s perspective, this might be the easier solution, because the company wouldn’t have to license a stable of games from developers and publishers. But from a user standpoint, it wouldn’t offer quite as much value if you had to buy each game you wanted to stream individually, rather than having access to a large lineup of games from the start. And of course, there’s a hybrid of the two schemes, which would require a monthly sub plus forcing users to buy games. But that’s messy, complicated, and too expensive, which is why no other game streaming services do this, and why Google almost certainly won’t either. So which model would you prefer, and how much would you be willing to pay for Google Stadia’s game streaming service?